The phone which was continuously gaining popularity day by day by it’s massive marketing campaign including commercial advertisement, discussions on social networking site, smartphones news headline as Micromax Canvas 4 has been finally launched at a premium price tag of Rs 17,999. Company has started taking pre-order for this device from June 28 onwards. Company has already received 15,000 approx. pre-orders for this device surpassing even many branded manufactures in the terms of quantity of pre-booking of any recently launched handset. It wouldn’t be wrong to say that Micromax is giving a tough fight against the other leading manufacturers to run for their money. Few weeks ago we discussed the specifications and details of Micromax Canvas 4 from our sources which are correct in terms of all the details. To recap all it’s details and specifications, in terms of display this device display , it sports 5 inch of HD IPS capacitive touch screen display with 1280 x 720 of pixels resolution. To protect the display from scratches, it uses corning gorilla glass protection. To let the user make use of multiple single on a single handed device, this device supports dual sim (GSM+GSM) with dual standby technology. Dealing with it’s Platform dependency, this device sails on Android 4.2.1 jelly bean operating system powered with a quad core processor at a clock speed of 1.2 Ghz. Enumerating it’s storage specifications, to make the combination of big screen, fast processor more attractive for their buyers it supports 1GB of RAM which makes the overall the overall performance more smoother and faster. It supports 16GB of Internal memory which is capable of storing an ample amount of data, internal memory can be expanded up to 32GB via micro SD card slot. Coming towards it’s photography specifications, this device is equipped with both the primary and secondary snapper options. On the back panel, this device a 13MEGAPIXEL of primary camera which is capable of 1080p of video recording. On the front side, it has been installed with a 5MEGAPIXEL of front facing camera for video chatting. Some of the other features of camera include LED flash. Connectivity wise, 3G, WiFi 802.11 b/g/n, Bluetooth, GPS/A-GPS. In terms of it’s power station, this device receives power from 2000mAh of battery. The Micromax Canvas 4 is priced at Rs. 17,999 and comes with a free touch cover worth Rs. 3000 that would let you use the phone even when the cover is on. However, the pricing of phone seems to be on higher side, we wonder what is the strategy of Micromax to launch it on such price. Feature like smart-pause which pause video if you stare away from your phone is there but still considering the image of Micromax as a value for money brand, this handset appears to be little costly. However, as already mentioned, they have received a good number of pre-bookings , would be interesting to see how it performs in long term. 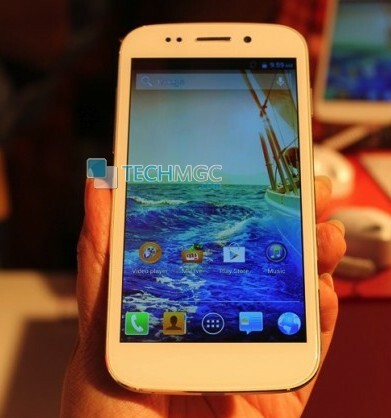 Micromax Canvas 4 is a good phone to buy in India. The Phone has quad core processor, 1 GB RAM and other new features but the phone still lacks good specs and over priced that’s why getting negative reviews from users. But still it is a good choice, better than Samsung and Nokia phones.